Sister to Chef Geoff’s, Lia’s is a neighborhood gem featuring housemade pasta, handcrafted using old world technique, with a modern twist, alongside a broad and delicious selection of steak, seafood, salad and pizza. Each week, Executive Chef Santos Fuentes offers weekly seasonal specials served by our welcoming service staff. Whether enjoying our large lounge area, the best outdoor patio in Chevy Chase, or our intimate dining room, we offer the perfect setting for a romantic date, casual meet up or dinner with the family. 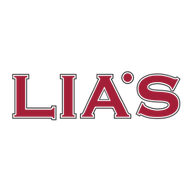 I’ve been to the Chef Geoffs on New Mexico so I was excited to try Lia’s and it BLEW MY MIND! Peter immediately came over greeted me and took my order. He was super friendly and happy to serve us! We also got bottomless mimosas and he made sure to continuously check up on us to make sure everything was going fantabulous!! Will definitely be back ! Chef Santos likes to mix things up in the kitchen and this is his chance to show off. A passionate Chef with a flair for fresh, unique creations, he’ll keep you guessing about what’s next! Over in our lounge you can find Eileen keeping things interesting with her fun, funky weekly craft cocktails. Our spacious, bustling lounge offers the area’s best and biggest Happy Hour! For our vino lovers! Half price selected wine bottles every Wednesday. Three courses for $27.95 every day from 4-6:30pm. Whether on our breezy patio, lively lounge or in the beautiful dining room, Every Saturday & Sunday 11:30-3:00pm we keep the Bottomless Mimosas flowing—your choice of five flavors for $15.95. Our brunch menu is extensive & creative. A Chevy Chase brunch destination.